This year we have been living through a rare series of dates which would have delighted a medieval expert on the calendar. As I discussed a few months ago, Good Friday fell this year on March 25, which was traditionally believed to be the historical date of both the Crucifixion and the Annunciation. 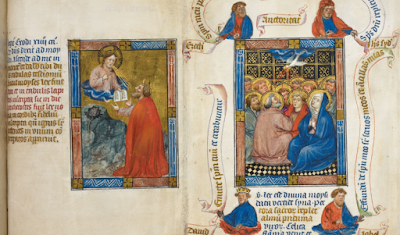 All subsequent dates which are dependent on Easter have therefore also fallen this year on their 'true' dates, including the Feast of the Ascension (May 5) and tomorrow's feast, Pentecost, which is on its supposed historical date of May 15. From an early date in church tradition, other important events in salvation history were aligned with these significant dates, with which they were typologically linked: March 25 was said to be not only the date of the Crucifixion and the Annunciation to Mary, but also Old Testament events which foreshadowed Christ's death, such as Abraham's sacrifice of Isaac, the crossing of the Red Sea, and so on. 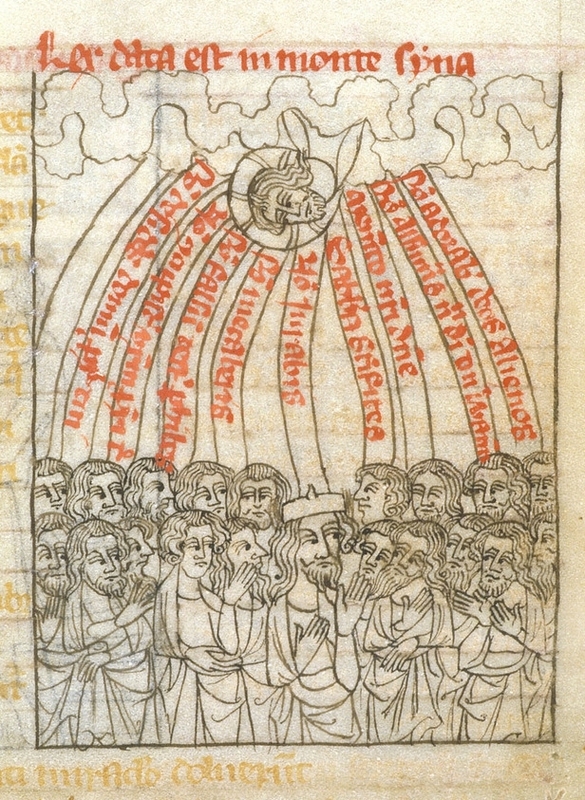 However, from the very beginning Pentecost already commemorated two anniversaries which link the Old Testament and the New: it takes its date from the Jewish festival celebrated fifty days after Passover, marking the day when the law was revealed to Moses on Mount Sinai, and therefore subsequently the date fifty days after Easter when the Holy Spirit descended on the apostles. It's a double anniversary in more ways than one. 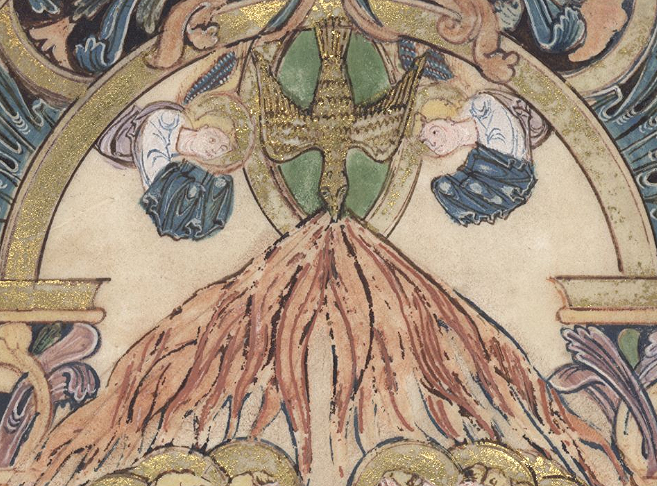 On þone fifteogðan dæg þæs monðes bið se micla dæg þe is nemned Pentecosten. Se dæg wæs mære on þære ealdan æ ær Cristes cyme, forðon þe on þone dæg God spræc to Moyse of heofonum geherendum eallum Israhela folce. Ond þy dæge God sealde his æ ond his bebodu þæm ylcan folce on twam stænenum bredum awritene on Sinai þære dune; ond eft æfter Cristes uppastignesse to heofonum þy ilcan dæge he onsænde his þegnum þone halgan gast, ond ealra þara monna wæs on anum huse hundteontig ond twentig. Þa færinga wæs geworden sweg of heofonum swa swa stranges windes sweg: ond se sweg gefylde þæt hus þær hi sæton, ond ofer heora ælcne onsundran sæt swa swa fyr, ond hi mihton þa sona sprecan on æghwelc þara geþeoda þe under heofonum is; ond þa hælendes þegnas mihtan siððan don heofonlico wundor þurh þone gast. Þæm gaste æghwelc gefullwad man nu onfehð þurh biscopa handa onsetenesse, ond se gast wunað mid æghwelcne þara þe god deð, ond he gefyhð on þæs clænan mannes heortan swa swa culfre, þonne heo baðað on smyltum wætre on hluttere wællan. On the fifteenth day of the month is the great day which is called Pentecost. This day was celebrated in the Old Law before Christ’s coming, because on this day God spoke to Moses from heaven, in the hearing of all the people of Israel. And on this day God gave his law and his commandments to that people, written on two stone tablets, on the mountain of Sinai. And again, after Christ’s ascension into heaven, on that same day he sent the Holy Spirit on his followers, and all the people who were in the house, one hundred and twenty. Then suddenly there came a noise from heaven like the noise of a strong wind, and the noise filled the house where they were sitting, and over each of them individually there rested something in the likeness of fire. And at once they were able to speak in every one of the languages which are under heaven, and the Saviour’s followers were afterwards able to perform heavenly miracles through that spirit. Every baptised person now receives that Spirit through the laying-on of the bishop’s hands, and the Spirit dwells with all those who do good; and it rejoices in the heart of the pure man, like the dove when she bathes in quiet water in a clear well-spring. That last sentence is just beautiful. 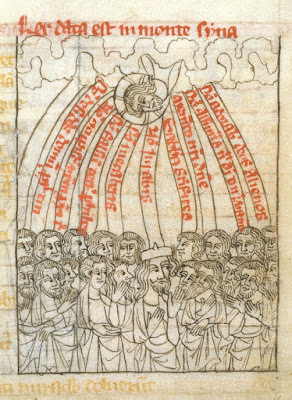 While the Holy Spirit at Pentecost is a noisy rush of sound and fire (swa swa stranges windes sweg, 'like the noise of a strong wind'), the indwelling Spirit conferred at baptism is calm and peaceful as a dove, bathing in the clear and cleansing waters, which are described as hlutor 'clear, pure, bright'. In order to stamp the memory of this more firmly on the hearts of believers, a beautiful custom of holy Church has grown up, so that each year the mysteries of baptism are celebrated on this day, and as a result a venerable temple is made ready for the coming of the Holy Spirit upon those who believe and are cleansed at the salvation-bearing baptismal font. In this way we celebrate not only the recollection of a former happening, but also a new coming in the font of the Holy Spirit upon new children by adoption. Bede the Venerable, Homilies on the Gospels: Book Two, Lent to the Dedication of a Church, trans. Lawrence Martin and David Hurst (Kalamazoo: Cistercian Publications, 1991), pp.170-1. 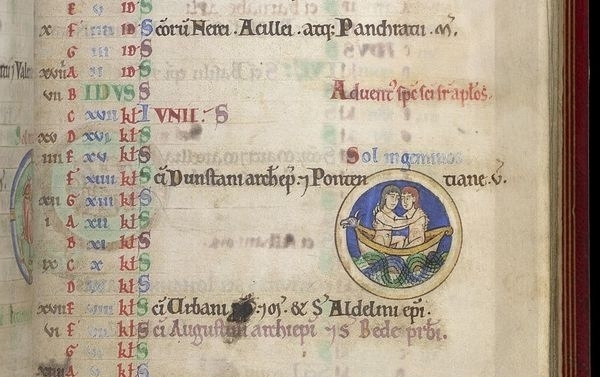 In his Historia Ecclesiastica, Bede provides some examples of the early Anglo-Saxon church conforming to this practice: the baby girl he calls 'the first of the people of the Northumbrians to be baptised', Eanflæd, daughter of King Edwin of Northumbria and his wife Æthelburh, was baptised with a number of others on Whitsunday in 626. Therefore, you dear ones, be attentive to how the type and figure of the feast of the law is in agreement with our festivity. When the children of Israel had been freed from slavery in Egypt by the immolation of the paschal lamb, they went out through the desert so that they might come to the promised land, and they reached Mount Sinai. On the fiftieth day after the Passover, the Lord descended upon the mountain in fire, accompanied by the sound of a trumpet and thunder and lightning, and with a clear voice he laid out for them the ten commandments of the law. As a memorial of the law he had given, he established a sacrifice to himself from the first-fruits of that year, to be celebrated annually on that day... The law was given on the fiftieth day after the slaying of the lamb, when the Lord descended upon the mountain in fire; likewise on the fiftieth day after the resurrection of our Redeemer, which is today, the grace of the Holy Spirit was given to the disciples as they were assembled in the upper room. He draws a parallel between going 'up' the mountain and the 'upper room'; like Moses and the disciples, anyone who wishes to receive the Spirit must leave behind the things below and ascend to the heights. [It] was not without deep significance that the number fifty was observed in the giving both of the law and of grace. It was on the fiftieth day after Passover that the former was given to the people on the mountain, and the latter to the disciples in the upper room. By this number the long-lasting quality of our future rest was surely being shown, since on this fiftieth day the ten commandments of the law were delivered, and the grace of the Holy Spirit was given to human beings. This was to point out clearly that all who carry out the commands of the divine law with the help of the grace of the Spirit are directing their course toward true rest. In the law, the fiftieth year was ordered to be called the year of jubilee, that is, ‘forgiving’ or ‘changed’. During it the people were to remain at rest from all work, the debts of all were to be cancelled, slaves were to go free, and the year itself was to be more notable than other years because of its greater solemnities and divine praises. Therefore, by this number is rightly indicated that tranquility of greatest peace when, as the Apostle says, at the sound of the last trumpet the dead will rise and we shall be changed into glory. Then, when the labours and hardships of this age come to an end, and our debts, that is all our faults, have been forgiven, the entire people of the elect will rejoice eternally in the sole contemplation of the divine vision, and that most longed-for command of our Lord and Saviour will be fulfilled: Be still and see that I am God. Since it is only by observance of the heavenly commands and the gift of the Holy Spirit that this stillness and vision of unchangeable Truth is reached, both the law of the ten commandments and the grace of the Spirit were given on that particular one of the days which designates rest. Nor is it to be passed over that this number fifty is appropriate to signify inward tranquility, for it is arrived at by multiplying seven times seven and adding one. Under the law the people were ordered to work for six days and to rest on the seventh, and to plow and reap for six years and desist during the seventh, because the Lord completed the creation of the world in six days and desisted from his work on the seventh. 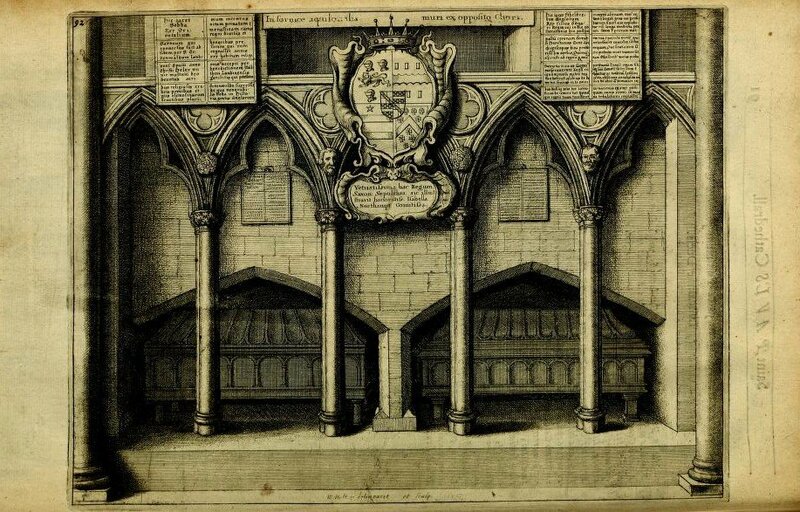 Mystically speaking, we are counselled by all this that those who in this age (which is comprised of six periods) devote themselves to good works for the Lord’s sake are in future led by the Lord to a sabbath, that is, to eternal rest. A person who trusts that he can find rest in the delights and abundance of earthly things is deceiving himself. By the frequent disorders of the world, and at last by its end, such a one is proven convincingly to have laid the foundation of his tranquility upon sand. But all those who have been breathed upon by the Holy Spirit, and have taken upon themselves the very pleasant yoke of the Lord’s love, and following his example, learned to be gentle and humble of heart, enjoy even in the present some image of the future tranquility. Homilies on the Gospels, trans. Martin and Hurst, pp.171-6. We might be prompted in a pleasing way, by this annual festive celebration, to enkindle our desire always to obtain and hold fast to festal times that are not annual but uninterrupted, not earthly but heavenly. Our true bliss is to be sought not in the present time of our mortality, but in the eternity of our future incorruption – the solemnity where, after all our anguish has ceased, our life will be led totally in the vision and praise of God. Homilies on the Gospels, trans. Martin and Hurst, p.156. 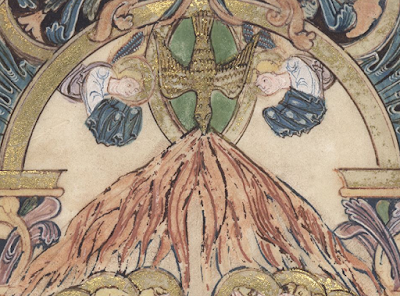 See this post for a Pentecost sermon by Ælfric and some Old English poetry on the gifts of the Spirit, and here for a beautiful Middle English version of 'Veni Creator Spiritus'. Ða gelamp hit þæt se cyning æþelred forðferde ær ða scypo comon, he geendode his dagas on Sancte Georgius mæssedæg æfter myclum geswince 7 earfoðnyssum his lifes. 7 þa æfter his ende ealle þa witan þe on Lundene wæron 7 seo buruhwaru gecuron Eadmunde to cyninge, 7 he his rice heardlice wærode þa hwila þe his tima wæs. Þa comon þa scipo to Grenawic to þam gandagum, 7 binnan litlan fæce wendon to Lundene 7 dulfon þa ane micle dic on suðhealfe, 7 drogon hera scipo on westhealfe þære bricge, 7 bedicodon þa syððan, 7 þa buruh utan, þæt nan man ne mihte ne inn ne ut, 7 oftrædlice on þa buruh fuhton, ac hi him heardlice wiðstodon. Þa wæs Eadmund cyng ær þan gewend ut 7 geard þa Westseaxon, 7 him beah eall þæt folc to. This is the Anglo-Saxon Chronicle's description of the events of April-May 1016, picking up where we left it a month ago. After Cnut had obtained the submission of the north, by fair means or foul, the war shifted south again to London, where King Æthelred had been holed up for the past few months. And there he died, on St George's Day, after a reign of 38 years (minus one brief interruption) - one of the longest reigns of any English monarch, despite all his 'labour and difficulties'. At that time, on Monday, 23 April, in the fourteenth indiction, Æthelred, king of the English, died, after the great toils and many tribulations of his life. 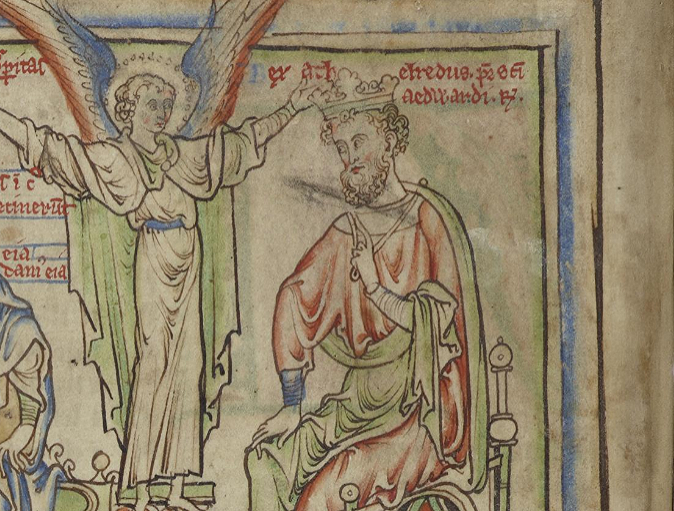 These St Dunstan had prophetically announced could come upon him when he, on the day of his coronation, had placed the crown upon his head: ‘Because,’ he said, ‘you obtained the kingdom through the death of your brother, whom your mother killed; hear therefore the word of the Lord. Thus saith the Lord, ‘The sword shall not depart from thine house, raging against thee all the days of thy life’, slaying those of your seed until your kingdom is given to an alien power whose customs and tongue the people you rule do not know; and your sin and your mother’s sin and the sin of the men who committed murder at the wicked woman’s advice will not be expiated except by long-continued punishment.’ His body was honourably buried in the church of St Paul the Apostle. The Chronicle of John of Worcester, ed. and trans. Jennifer Bray and P. McGurk (Oxford, 1995) vol. ii, p.485. Anyway, very soon after Æthelred's death the Danish army set about to besiege London. 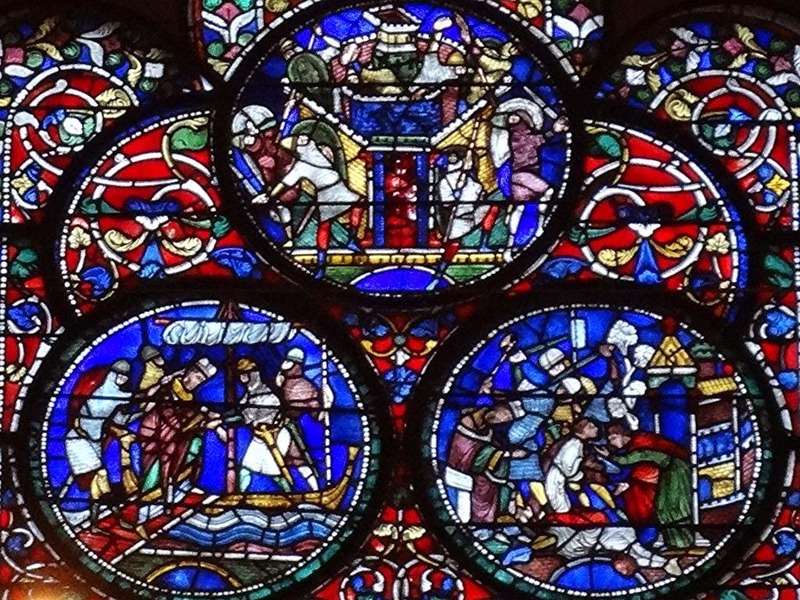 They arrived during the Rogation Days, the three days before Ascension Day, which were on 7-9 May in 1016. They dragged their ships to the west of London Bridge, presumably because the bridge itself was heavily defended, and then bedicodon 'bedyked' the city. ordered the city of London, the capital of the country, to be besieged, because the chief men and part of the army had fled into it, and also a very great number of common people, for it is a most populous place. And because infantry and cavalry could not accomplish this, for the city is surrounded on all sides by a river, which is in a sense equal to the sea, he caused it to be shut in with towered ships, and held it in a very strong circumvallation. And so God, who wishes to save all men rather than to lose them, seeing these natives to be pressed by such great danger, took away from the body the prince who was in command of the city within, and gave him to everlasting rest, that at his decease free ingress might be open to Knútr, and that with the conclusion of peace the two peoples might have for a time an opportunity to recover. And this came to pass. For the citizens, having given their prince honourable burial, and having adopted a sound plan, decided to send messengers and intimate their decision to the king, that is to say, that he should give them his pledge of friendship, and should take peaceful possession of the city. This occurred at a time when it seemed acceptable enough to Knútr, and a treaty was made, a day being arranged for his entry. But part of the garrison spurned the decision of the citizens, and in the night preceding the day on which the king made his entry, left the city secretly with the son of the deceased prince, in order to collect a very large force again, and try if they could perhaps expel the invading king from their country. And they did not rest till they had assembled nearly all the English who were still inclined to them rather than to Knútr. Knútr, however, entered the city and sat on the throne of the kingdom. But he, nevertheless, did not believe that the Londoners were yet true to him, and, accordingly, he had the equipment of his ships renewed that summer, lest if the army of his foes happened to besiege the city, he should be delivered by the foes within to those without and perish. Guarding against this, he again retired for the moment like a wise man, and having gone on board his ships, he left the city and went to the island called Sheppey with his followers, and wintered there, peacefully awaiting the outcome of the matter. And so Eadmund - for so the youth who had collected the army was called - when Knútr retired, came with an army not insignificant but immense, and entered the city in state. Soon all followed him, obeyed him, and bestowed their favour upon him, and urged him to be a bold man, declaring that he rather than the prince of the Danes was their choice. Encomium Emmae Reginae, ed. and trans. Alistair Campbell (London: Royal Historical Society, 1949), pp. 23-5. 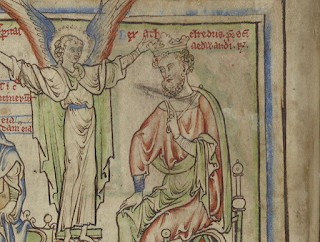 Note that the Encomium - notoriously - does not name Æthelred, 'the prince who was in command of the city', even though he was the first husband of the woman for whom this text was written. Apparently Emma preferred not to mention him; but Edmund (her stepson) is described favourably here and throughout the account of Cnut's invasion. Let us go ashore, before the staves of the metal-rain [BATTLE > WARRIORS] and large militias of killing learn that the ancestral lands of the English are traversed with the shield. Let us be brave-minded in battle; let us brandish spears and shoot [them]; an ample number of the English takes to flight before our blades. Knútr decided and commanded all the Danes to wait; the mighty tree of the ring-support [SHIELD > WARRIOR = Knútr] went, brave, under the shields; the army fought by the moat. Syn [lady], it was nearly as if the master of the fire of Rennandi (river) [GOLD > MAN] were holding a maddened elk, where we attacked the army with helmet and mail-shirt. 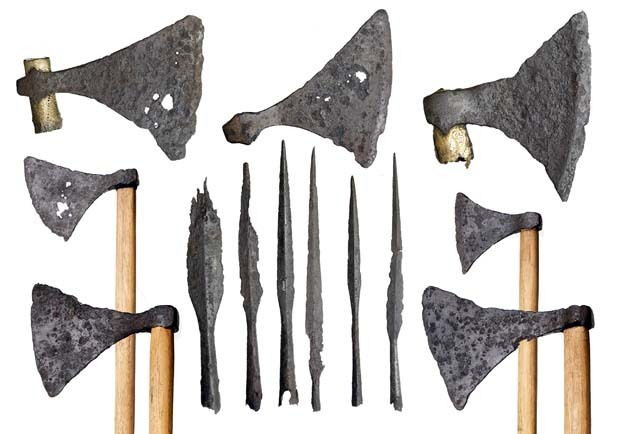 The chaste widow who lives in stone will look out — weapons often glint in the air above the helmet-wearing ruler — [seeing] how the victory-avid leader of the Danes [DANISH KING = Knútr] attacks sharply the men of the city; the blood-ice [SWORD] clangs against British mail-shirts. Every morning the Hlǫkk (valkyrie) of drinking horns [WOMAN] sees the helmet-destroyers [SWORDS] reddened with blood on the bank of the Thames; the seagull of Hangi ( = Óðinn) [RAVEN/EAGLE] must not go hungry. As he had promised his men, Hereward returned to England, together with his two nephews, who were now distinguished in all warlike matters, and his wife Turfrida... They found some of his men in hiding, protecting themselves. Rejoicing at his return, these men quickly hastened to join him: namely, a certain Winter, a distinguished fighter, who was short in stature but very tough and strong, and Wenoth and Ælfric Grugan, notable in all courage and strength. These, as effective in deeds as they were big and tall, were joined by three of Hereward's nephews: Godwine Gille, who was called Godwine because he was not inferior to the Godwine, son of Guthlac, who was greatly celebrated in the tales of the ancients; and Duti and Outi, two twin brothers, alike in character and appearance and both praiseworthy warriors. However, the remainder of his band of followers was dispersed across the whole country. Before his departure he had arranged a signal for them, that he would set fire to three villages beyond Brunneswold near Bourne; and so he set them aflame and disappeared into the woods until his men were gathered around him. And when they were all assembled, they were all the most eminent men. Not one among them was considered to have achieved knightly rank unless he had first performed some praiseworthy deeds. These are their names, with those mentioned above making up the number: Wulfric the Black, who got his name because he had once stained his face with charcoal and gone unrecognized into a garrison, and laid ten of them low with a single spear; and his friend, a certain Wulfric Rahere, or 'Heron', who was called that because he once happened to be at Wrokesham Bridge when four innocent brothers were brought there to be executed, and terrifying the executioners, who had called him 'heron' in mockery, he valiantly set the innocent men free and killed some of their enemies. 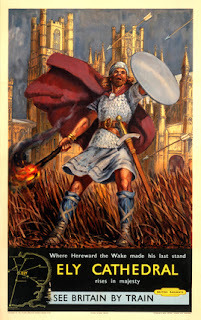 Others too were numbered among the more famous of Hereward's knights: Godric of Corby, nephew of the Earl of Warwick, and Tostig of Daveness, kinsman of the same earl, whose name he received at baptism; Acca Vasus, the son of a nobleman from the outskirts of Lincoln who owned one of the towers of the city; and Leofwine Mowe, that is 'Sickle', who got his name because once when he happened to be alone in a meadow cutting grass, he had been set upon by a score of local peasants with iron pitchforks and spears in their hands, and single-handed, with only his sickle, he wounded many and killed some, charging among them like a reaper and finally putting them all to flight. In company with these was also a certain Turbeorht, great-grandson of Earl Edwin, and Leofwine Prat, that is 'Crafty', who though frequently captured by his enemies cunningly escaped, often killing his guards - and so he had this nickname. And in addition to these must be numbered others, also very experienced in warfare: Leofric the Deacon and Ullicus [or perhaps 'the bailiff'] of Drayton, Thurkell and Utlahe (that is 'Outlaw'), Hereward's cook Hogor, Hereward's kinsmen Winter and Leofred, two distinguished men, and Rapenald, steward of Ramsey. These were leaders; so too were Wulfric the Black and Wulfric the White, Ælfric Grugan, Ylard, Godwine Gille, Outi, and the other Outi mentioned before, and those two splendid men, Siward and the other Siward the Red, who were Hereward's nephews. With these there were other most eminent knights: Godric of Corby, the Norman priest Hugo and his brother Ylard, Leofric the Deacon, Tostig of Rothwell and Godwine of Rothwell, Osbern, Alsinus, Leofwine Prat, Thurcytel, and Ullicus of Drayton. All of these were indeed the most distinguished and splendid knights in the whole kingdom; and there were several others, whom it would take too long to name and describe separately. The Latin can be found here. 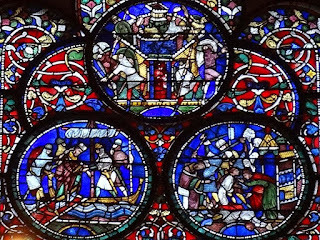 This assortment of tales and nicknames suggests a lively culture of story-telling, which provides an interesting context for the reference to the 'tales of the ancients' about Godwine, son of Guthlac, which I discuss in the article. Some of the stories here may have come directly from the men concerned; the author of the Gesta Herwardi says he had met two of Hereward's companions, 'Brother Siward of Bury St Edmunds and Leofric Black', who were by his time still 'men of distinguished appearance, although they had lost the beauty of their limbs because of the trickery of enemies'.